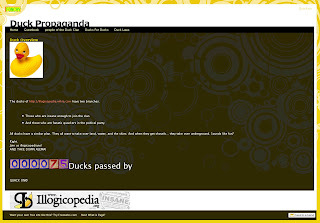 The first (and maybe the last) Illogicopedia spin off website, the website for both the Duck Clan and the Ducks for Ducks political party is an exercise in propaganda. Not that there's anything wrong with that. Created by Fonchezzz of Illogicopedia fame, the site is the official source for the latest Duck related stuff. The prospective Duck Clanner can view the party's laws as well as get more information on both the political party and the clan, which is all you can ask for really. Quack! A must for Duck Clan fans and members alike. Be sure to sign the guestbook! yay! ducks! Boo! anti ducks!